1/4/2015 ~ My learning curve re algae has brought me to the point where I’ve seen plants reduce algae, I’ve grown carelessly reliant on plants, and sadly I stopped paying attention, which is when the algae masked the plants in black. Yes, the algae won. Briefly. 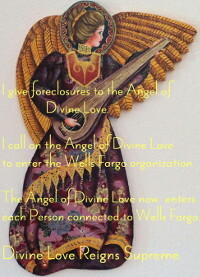 In my defense I was working on Foreclosure Awareness: Wells Fargo was/is threatening my home which actually impacts my goldfish because I don’t see us happily surviving homeless: my goldfish in a small tank in a shopping cart. 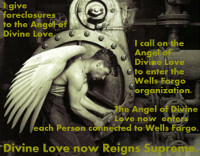 Foreclosure Awareness ~ Read more. 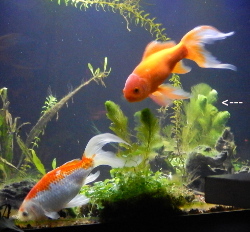 When my female goldfish lay on the bottom of the aquarium, apparently suffering a swim bladder problem from bad water quality, her ill health ripped a hole in my belief that the plants were working. My belief had blinded me to the struggle going on between plants, algae and ammonia. 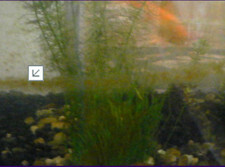 I had failed to see that Baby Tears plants were losing piles of leaves, as it were, when the goldfish munched on them. The leaves filled parts of the filter, much the same as tree leaves fill the gutters on your home. So while I’d been feeling safe in certain facts: I wasn’t over feeding my goldfish so there wasn’t rotting food, and my Eco-Complete substrate was full of bacteria to convert ammonia from fish waste to nitrite and convert again to nitrate which plants happily use for growth, I overlooked the fact that my filter was harboring a mess of decaying, ammonia producing plant detritus. Waste from fish, plants, and food breaks down and releases ammonia. Ammonia is toxic to fish and must be converted to nitrite by bacteria. Nitrite, also toxic to fish, must again be converted by bacteria, this time to nitrate. Nitrate is not as toxic and is used by plants or algae in their growth. If only I’d kept an eye on things I would have more assiduously changed the water to avoid nitrite buildup that seems to foster black algae attaching eagerly to plants, the broader their leaves, the better. Mats of Baby Tears, however nice they look to start, and however much my goldfish love them for lunch, have got to be a thing of the past. Mats of Dwarf Pennywort, on the other hand, appeared to shed few leaves when being lunched upon. In addition, pennywort gave the impression it could grow in the medium light conditions of my tank. Perhaps if my goldfish ate less of it, it could have remained lush. Instead it thinned and its leaves became edged with blackish algae. Dwarf Pennywort Mat ~ Site where I buy mine. In the picture you can see my female goldfish in one of her apparent losses of consciousness. She loves to dig in the substrate, but when the water quality has been allowed to go off, she seems to involuntarily fall asleep. Apparently a high ammonia content in aquarium water can interfere with a goldfish’s swim bladder function. The male goldfish often comes and nudges her. When that doesn’t work to get her moving again, he will lie beside her. 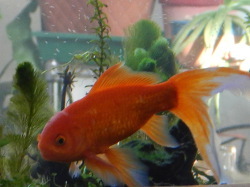 I think the reason his swim bladder isn’t affected is that over the years he’s spent a lot of time swimming along the top of the water, breathing in, apparently, the air above the water’s surface. He has never been as interested in digging as she is. At one point I was going to name him Pilot for his high-flying swimming, and her Prospector. In my search for a more aggressive algae busting, oxygenating plant, I found Cabomba. I ordered it as well as new Pennywort mats. Upon arrival I acclimated the plants. When their temperature reached that of my home and the aquarium water I made holes in the mats and pushed through bunches of Cabomba ~ possible because the bunches had collars of a magnesium kind of solder. Changing a quarter of the water and adding Cabomba and Pennywort doesn’t help immediately. It takes several water changes and a couple weeks for her to regain the ability to dig without losing consciousness. Cabomba ~ Where I buy mine. 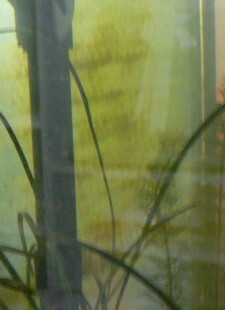 April 2, 2010 – Ehhhh, Algae. I was not expecting algae now that I have a filter, but algae there is. It’s interesting that the algae has formed in straight lines. At first I thought the aquarium had been used in display at PetSmart, but they assured me that it had not. Googling led me to articles that said leaving some algae is a way to limit algae formation based on the fact that there is only so much nutrient in the water. With a filter the uneaten food and fish droppings are taken out, which limits nutrient available for algae. Leaving a bit of algae to gobble up (as it were) remaining nutrients reduces the amount of nutrient left for the formation of new algae. That explained, it seemed to me, the straight lines of algae in my aquarium: When I was setting it up I put in the Eco-Complete substrate, added Britta filtered water and let it set over night. The line of algae is at the level of the water the first night. That suggests that some nutrients from the Eco-Complete rose to the surface and clung to the glass. 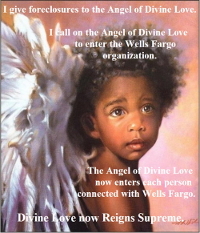 Then, next day when I added more water in stages, the nutrients rose like rungs in a ladder toward the top. When algae began to form, it thrived best where the nutrients had stuck to the glass. Additionally, algae grew most vigorously where sun from my clerestory hit the aquarium: just right of the filter tube. Notice how much less algae there is to the left of the tube. Now that I see how much light affects algae growth, I’m not leaving the light on as much as I had previously. 1/20/2015 ~ Today I’m using MORE lights in order to keep the Cabomba alive and happy. Over the past month it appears that the Cabomba is able to use the light, and associated heat, to stay alive and use up nutrients that would otherwise have nourished algae. So far, so good. Algae is not building up.